Mandatory testing – ABO and RhD blood type, viral screening, red cell antibody screening and syphilis testing. Bacterial contamination screening – platelets are stored at room temperature, and are therefore at a greater risk of growing bacteria than other blood products. For this reason all platelets are screened for contamination. Red blood cells transport oxygen. Red cell transfusions are used for people with cancer and other blood diseases, people having surgery, people with anaemia, people during childbirth, and trauma patients. More information can be found under the 'What's in a bag of red cells?' webpage. The graph below illustrates how the supply trend for red cells has gone from 768,919 units in 2007-08 to 763,542 units issued in 2012-13. 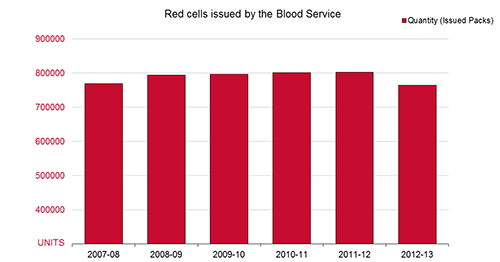 A reduction in red cell demand was experienced for the first time in 2012-13. To view the above chart and related data in Excel format download Red Blood Cells Issued by the Blood Service 2007-13 Chart and Data (xls)  (40.5 KB). Platelets are important for blood clotting and tissue repair. A low platelet count is called thrombocytopenia. Platelet transfusions are required when patients have a low platelet count, or have problems with their platelet function. These patients include people with cancer who are receiving chemotherapy, people who have a bone marrow transplant, people who take medicines that interfere with platelet function and patients who are bleeding. More information can be found under the 'What's in a bag of platelets?' webpage. 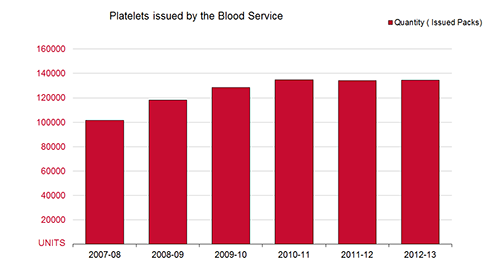 The graph below illustrates how the supply trend for platelets has continued to increase from 116,665 units in 2007-08 to 134,576 units issued in 2012-13. Plasma is the liquid component of blood, and is mostly made of water. Plasma carries blood cells and other substances around our body. The Blood Service manufactures three plasma products as described below. Plasma is the liquid component of blood. Fresh frozen plasma is used to replace clotting factors and also by patients who need to quickly reverse the effects of blood thinning medications. More information can be found under the 'What's in a bag of plasma?' webpage. Cryoprecipitate is made from fresh frozen plasma. It contains proteins, including fibrinogen, involved in blood clotting. Cryoprecipitate is used in patient where they have a reduced level of fibrinogen, or where their fibrinogen is not working property. This may include during a trauma, or massive bleeding. More information can be found under the 'What's in a bag of cryoprecipitate?' webpage. Cryodepleted plasma is made from fresh frozen plasma. It used most commonly in plasma exchange for patients with thrombotic thrombocytopenic purpura (TTP). More information can be found under the 'What's in a bag of cryodepleted plasma?' webpage. The Blood Service also provides plasma to CSL Ltd for the manufacture of plasma derived products .